Much of the reason you chose to live in London Grove Township is because of its location. One of the key selling points is that it lies entirely within the watershed of the scenic White Clay Creek. Lovely creek vistas and mature forests, rolling hills and pastoral farm scenes, varied and abundant wildflowers and wildlife, historic sites and recreational opportunities — all these attractive features also led to its declaration as a National Wild and Scenic River in 2000. What’s more, White Clay is unique among Wild and Scenic Rivers. It is the first time an entire watershed – rather than just a section of river – has been designated into the system. This “beyond-the-riverbank” approach takes into consideration the changing land uses along the 190 stream miles and the impacts they have on river habitat and water quality. The White Clay watershed is simply all the land area that drains into the White Clay Creek. Rainfall or snowmelt within London Grove Township eventually ends up in the White Clay Creek or the ground water that feeds the creek. So the whole Township is within the watershed. National Wild and Scenic Rivers are created by an Act of Congress. Designation is made on the basis of “outstandingly remarkable scenic, recreational, geologic, fish and wildlife, historic, cultural, or other similar values” so the river and surrounding area can be preserved and protected for the benefit and enjoyment of present and future generations. A National Wild and Scenic River designation encourages appropriate development – the kind of development that coexists with the river and preserves watershed features that are important historic and cultural resources or enhance water quality, natural resources, and overall quality of life. A Management Plan was developed during the designation study to protect these important features. And since the White Clay is a Partnership Wild and Scenic River, the National Park Service is partnering with the local community and governments to implement that plan. Rather than the federal government purchasing the land, it remains in private or state, county, or municipal government ownership. Consequently, local municipal ordinances are the “heart & soul” of the Management Plan. London Grove’s ordinances, for example, are responsible for much of protection and preservation of the watershed within its boundaries. And as residents of the White Clay Watershed you also share responsibility for maintaining the characteristics that make the watershed special. How you maintain and manage your properties – your personal piece of the watershed – reaches beyond your property line. The White Clay Wild and Scenic River Program is managed by a bistate Watershed Management Committee composed of local citizens, representatives of various organizations or interest groups, and delegates from local and state government. The National Park Service provides staff to help link the Committee to other agencies and the public, provides technical and financial support, and has oversight over development projects that require federal permits or use federal funds. Together with partner organizations and municipalities, the committee and National Park Service are working to carry out the Management Plan. 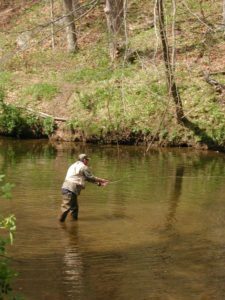 Open Space Preservation – Assisting with the active pursuit of several watershed properties for preservation; last year 235 acres were added to the Pennsylvania White Clay Creek Preserve and Delaware’s White Clay Creek State Park. Municipal Ordinance Survey – Contracting a survey of ordinances within watershed municipalities to determine if they are consistent with the Management Plan. Water Quality Analysis – Providing base funding for the analysis of White Clay Creek stream watch data; partnering municipalities, including London Grove Township, are also helping in this effort. White Clay Creek State of the Watershed Report – Providing funding for an anticipated fall printing of a report on the current status of the watershed’s health; the report is being generated by one of our partners, the Water Resources Agency at the University of Delaware. Lecture Series – Partnering with other local organizations to provide 1 to 2 lectures each fall or spring on outstanding watershed resources. Look for a fall program at the University of Delaware Agricultural College featuring the university farm as a model for habitat restoration and enhancement, stormwater management, and agricultural best management practices. Trail Guide – Producing a trail guide that for the first time will not stop at the state lines but include Pennsylvania’s White Clay Creek Preserve, Delaware’s White Clay Creek State Park and New Castle County Middle Run Valley Natural Area as well as Maryland’s Fair Hill Natural Resource Management Area. Stroud ‘Watershed Welcome Packet’- Providing technical assistance and supplementing Dockstader Foundation funding for this Stroud Water Research Center project. The packets will help newcomers to the watershed to value the resources and encourage their active role as watershed stewards. Residents can learn more about our activities or get involved with the Watershed Management Committee by visiting the White Clay website.